We love seeing the fabric combinations you all come up with! This beautiful assortment from Peapod & Nate marries a variety of fabrics from three different MontgomeryFest collections. Hope your week is full of Sunshine and Rainbows, and plenty of sewing! Whether you’re lounging at the beach, or poolside with a popsicle, stay on the Summer Side of life with this cheerful fabric collection. Dana Willard shares her love of color and novelty flair with designs that will make you smile—retro sunglasses, backyard berries, breezy blossoms, and a swimsuit soiree. Jump in and take a dip! We have yardage and Fat Quarter Bundles and don't miss the Free Quilt Pattern from Art Gallery. Click and scroll for pattern info! On the prowl for new exotic patterns? Northcott fabrics welcomes you to the jungle with Tiger Tales, a gorgeous collection full of lush florals and foliage and some very cool cats. 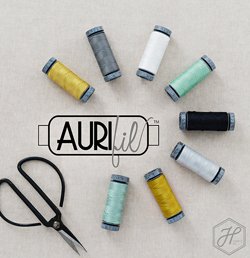 We have yardage and Fat Quarter Bundles, and check out the Free Quilt Pattern! 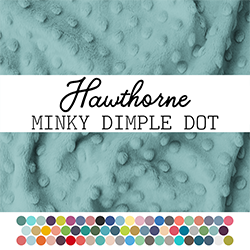 New Minky Dimple Dot Colors! Complete your Minky Swatch Rings with our new colors! Now offering over 70 Minky colors! Enjoy Greige, Ochre, Emerald, Lilac, Begonia, Petunia and Blush. We have Swatch Rings for our Bright and Soft groups. And if you've already purchased our Swatch Rings in the past, you can get your add on swatches here to complete your set! We managed to get Pinkerville back in full, so you know what that means?! More bundles! Fresh off the cutting table, we have Fat Quarter, Half Yard, and Full Yard Bundles back in stock, but they're going quickly! This room's gonna make you "howl" with delight! 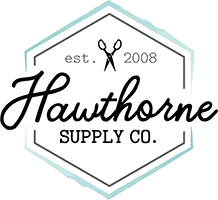 We are so excited to have been a part of this surprise room makeover by Violette Field Threads! Inspired by her daughter's beloved stuffed wolf, Jessica found the perfect wallpaper to the absolute delight of her lucky girl. The design is Howl at the Moon by Shopcabin, printed on our new Peel and Stick Woven Wallpaper. If you've been thinking about freshening up your decor, you'll want to check out Jessica's review with plenty of pretty pictures. And visit their Instagram Stories to watch the install and learn how incredibly easy it is! For our newest Giveaway we are offering up a Fat Quarter Bundle of the new My Unicorn collection from Kelly Panacci for Riley Blake! Congratulations to stepfar88, the winner of a Fat Quarter Bundle of the new Paper Art Safari collection from Windham! Please send us a quick message to let us know where we should send this winning prize!